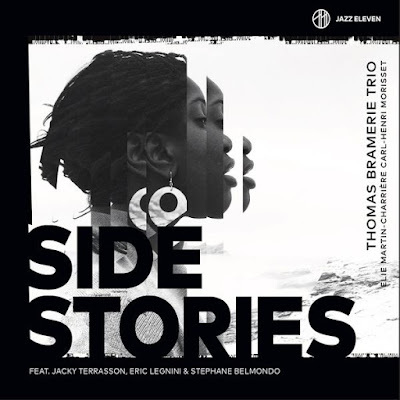 There is an inner strength, a sense of purpose and intent, an assuredness about French bassist Thomas Bramerie's playing. The first time I remember having been struck by it was on Dee Dee Bridgewater's Grammy-nominated album Live at Yoshi's, recorded in 1998. The group stretches out on every tune, and Bramerie's less-is-more instinct, the way he helps the stories to unfold, stays in my mind as one of the joys of a fine album. That recording was made just after Bramerie had moved to New York where he lived for around a decade. Another strong calling card for his unfazed and effective playing, from a time just after his return to France (alongside illustrious colleagues Mulgrew Miller and Lewis Nash, no less! ), is the album Deep in a Dream by Pierrick Pedron from 2007. The CD which results from that initiative brings to the fore some long-term relationships that have shaped Bramerie's career. I was interested to see that almost the only contexts in which this rare visitor to the UK has previously popped up on the LJN site (listed below) are as a member of Éric Legnini's trio, or else in trumpeter Stéphane Belmondo's Homage to Chet trio with Dutch guitarist Jesse van Ruller. Belmondo and Bramerie certainly go back a long way. They were already playing together in bands in the South of France as teenagers. When both of them speak on the EPK video below, one can hear the same unmistakeable twang of the Midi. Belmondo makes a guest appearance on two tracks and has also produced the album. Another distinguished guest is pianist Jacky Terrasson. This web of connections is tightened by the fact that the pivotal figure of Deghelt also has Belmondo and Terrasson on his management roster. Éric Legnini is the third guest on Side Stories. The presence of these guests on the album demonstrates what seasoned pros and strong personalities can bring to the party. They catch the ear every time, from the very moment they start playing, Legnini is featured on Rhodes on just two tracks, but his light touch each time is mesmerizing. Terrasson's duo with Bramerie, entitled Now, is an absolute gem and for me is probably the highlight of the album. And Stéphane Belmondo puts his heart, soul and innate lyricism into the long-lined ballad Un jour tu verras (one day you will see). However, these "invités de marque" bring an ever-present danger with them – or is it a delight? – that they can steal the show. Indeed, the pressure is on for the two younger musicians of Bramerie's trio, pianist Carl-Henri Morisset and drummer Elie Martin-Charrière. They were recommended to Bramerie by Pierrick Pedron. They are promising, proficient players, they rise to the occasion sometimes, but there are also moments – when listening to a tune like Chantez for example – when I found I just wanted more shape, more lift, more expression. The album comes with a 36-page, two-language booklet containing a series of reflections by Bramerie. He writes in French and a good clear translation is provided. There are ruminations on the purpose of music, on the joys of fatherhood, on the fact that he never attended a conservatoire. There is a lengthy peroration on the wisdom of waiting, of appreciating and savouring light and shadow. But in the end I think I learnt more about Bramerie's deeper feelings and instincts from, say, the beautifully controlled arco introduction to Émile, or from the from his authoritative time-lord role on a track in which the young players really do find their stride for once: a slow, sensitive and sunlit reharmonisation of Elgar's Salut d'Amour.